Do you need commercial or residential roof installation or repair that you can trust? Choose Burell Built Exteriors! Our family-owned and operated business is proud to serve parts of Tennessee, Alabama, Georgia, Kentucky, North Carolina, and Virginia. If you have questions about our services of areas served, call us today at (865) 385-6926. 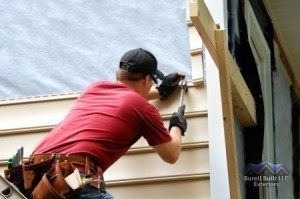 From Commercial Roof Installation to Siding Repair, We Do it All! Do you need fire damage repair for your residential shingle roof? Looking for a more energy efficient commercial roof system? Were your gutters and siding damaged by a recent hail storm? No matter what the problem is with your roof, our expert contractors can help. Fully certified and licensed, our roofers work with all types of roofs, from flat membrane roofs to designer slate. We can help you revamp your style, eliminate leaks, and ensure the safety and durability of your roof for years to come. We even offer maintenance plans and other roofing services to help keep your roof in shape all year round. Your roof is a critical part of your home or commercial building, bearing the brunt of harsh elements and temperatures 24 hours a day. It undergoes regular wear and tear just like any other object exposed to nature. However, with quality materials and skilled roof installation, it can last for many years. Call us today at (865) 385-6926 for quality roof installation and repair that you can rely on from Burell Built Exteriors! Updated on April 26, 2017 at 4:10 pm by Burell Built Exteriors.